With millions of transactions taking place every day, banking and financial institutions are exposed to substantial risks. At the same time, improving customer experience and management efficiency has emerged as a major task in the competitive financial world. The constant innovation in security with both technological breakthroughs and business integration has been an important enabler for banking and financial institutions to improve their efficiency. KEDACOM understands the key requirements of these industries and offers stable and reliable solutions. KEDACOM’s Banking Surveillance Solution provides clear video, security data and embedded intelligent features to assist in integrating your financial facilities, from branch offices to service centres. As a centralised monitoring solution that is easy to implement, manage and integrate, KEDACOM’s Banking Surveillance Solution assists you to manage the security of your clients and personnel, protect restricted areas and secure ATMs. Additionally KEDACOM also provides mobile solutions for guards, enabling companies to more efficiently handle different situations. • Entrances to bank agencies require detailed facial images even in environments with high lighting contrasts. With A full HD 120 dB Ultra WDR camera, it’s easy to get the image quality required. Some finance companies want to provide special services to VIP customers and KEDACOM’s face recognition cameras makes this possible. KEDACOM Ultra WDR cameras are ideal for deployment in entrances. • Lobby areas are always busy and also require detailed facial images without blind spots, KEDACOM’s 4K fixed box camera with a dedicated wide-angle lens meets this high-definition requirement. 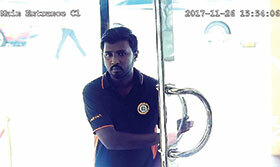 • To ensure the property and personal safety of customers and to protect their assets, discreet vandal-proof cameras keep a watchful eye on ATMs. These serve as deterrents and send automatic alerts when criminals attempt to steal or damage bank property, allowing the companies to take immediate action. The KEDACOM ultra WDR HD semi-dome camera with embedded intelligent functions, such as object left, guard line and more, assist in improved security management. • In mobile scenarios, such as cash transport or guard patrols, people are vulnerable to attack. KEDACOM’s body-worn camera system can be used to protect both the personnel and the assets they are protecting. These devices include a panic button for emergency situations and video, audio and even the GPS location can be uploaded to the command centre in seconds. The command centre could then initiate a response to protect property and personnel. KEDACOM’s high-performance NVR is also equipped with intelligent functionality and supports 64 IP cameras. The company provides a free CMS client for better monitoring, ensuring the administrators can access every camera as needed. Additionally, the NVR supports mobile body-worn camera access, allowing customers to monitor mobile video and audio from any patrol in any branch.